In Sarasota’s quaint Amish village, the holiday season has a flavor and magic all its own. Plus, a new kind of workout from Koko Fit Club. Brilliant flowers and fanciful creatures inhabit jewelry’s new Eden. Jenny Acheson and Dale Rieke turn a Lido Beach triplex into ultra-cool cottages. Your guide to Sarasota museums and art galleries. 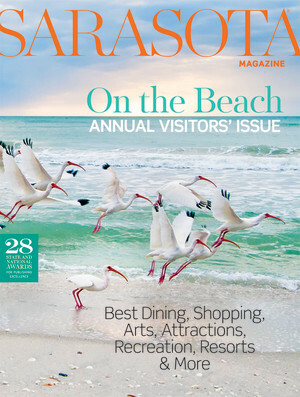 Your guide to Sarasota hotels and resorts. Your guide to Sarasota attractions. Your guide to Sarasota's sports offerings. A Sarasota archive maps the fantastic voyage of longtime Sarasota artist Syd Solomon and his wife, Annie. Welcome to that magical zone where the land meets the Gulf of Mexico. Tesla's Will Nicholas zooms into town. Shopping editor Carol Tisch rounds up beach-chic finds from Sarasota stores. Shopping editor Carol Tisch finds resort wear perfection in Trina Turk's floral maxi dress, available at Sarasota's L. Boutique.